snap up this chic vase shaped wicker tote - it’s 30% off today! Happy Monday, y’all! There are so many amazing sales in full swing and we're rounding up our favorites from shoes to purses to bedding to tabletop to make it super easy for y'all to shop! Take a peek at all our favorite finds below – and make sure to head on over to our art, hostess and getaway favorites because so many of our picks are on major markdown! 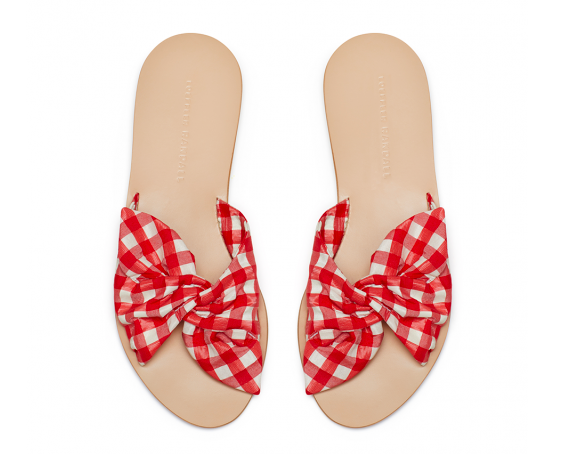 One of our favorites, Loeffler Randall is currently hosting an up to 40% off VIP Flash Sale! How darling is this straw tote with its gingham handles and this striped raffia clutch (make sure you take peek at the cute tassel detail)?!? Searching for a fun pair of black heels - we love these knot slides and they come in a higher heel height option as well! Head on over to J.Crew to snap up select pieces for 30% off! Our absolute favorite striped tee is on sale for $20 - if you haven’t snapped it up yet, now’s the time! We adore this gingham wrapped dress and it’s now on sale for $62! Needing a rain jacket for all those April showers? This classic rain jacket is a deal and comes in so many fun colors! Take 20% off and FREE SHIPPING at Williams Sonoma! We are loving Aerin's newest pieces like these botanical dinner plates, these timeless blue and white napkins and coordinating tablecloth! Also, not to be missed is Serena and Lily’s bedding sale - they’re offering 30% off and it ends today! Club Monaco has added so many chic pieces to their sale section! We can’t get enough of this timeless navy number, this clean lined white jumpsuit (it also comes in a polished black option!) and this pleated striped skirt! Want to see what we just added to our carts? We love this feminine silk blouse and this versatile silk top! Have you shopped the One Kings Lane 25% off Dining and Entertaining sale yet?!? We can’t wait for al fresco dinners under string lights and just snapped up these shell detail rattan coasters and these block print napkins… perfect for patio nights! We think these bistro chairs would look so perfect with this two toned textured rug on any porch! photo: tory burch / shop our favorite vintage sponge ware pieces here! Happy Friday, y’all! If you’re following along on Instagram you may have noticed we’re in sunny Dallas to partake and speak at the rewardStyle Conference… we’re so thrilled to be surrounded by so many passionate and talented women. We’ve recently received so many questions about our outfits and wanted to remind y’all that you can always directly shop all of our outfits on the LiketoKnow.It app! 1. Wondering what we packed for our trip? We can’t live without our striped-lined carry-on that is perfect for all of the essentials! We’re so happy to be in the warm weather and made sure to pack a few hats like this classic fedora and this vintage-inspired straw hat. We also brought a few different handbags including this confetti beaded pouch, this chic round bag (in our signature color, of course! ), and this honeypot basket bag we adore! 2. We were over the moon to be able to visit a brand we’ve been obsessing over, Leatherology! Have you checked them out yet? We had most magical behind-the-scenes look at their headquarters and are still swooning over seeing so many of their incredible pieces. Our favorite part was being able to watch the bespoke hand painting process (since you can add your monogram or initials to their products)! We adore this leather satchel (it comes in the prettiest of colors) and are about to upgrade our cosmetic bag! 3. Did you know that Serena & Lily is having a major sale on all bedding?! You know we can’t resist a fresh, crisp, cotton sheets so we’re snapping up a few of our favorite sets! We believe the perfect throw completes a room and are loving that this alpaca wool one is on sale! 4. We can’t get enough of these perfect-fit tees (they have the most flattering sleeve length) from our go-to source for staple pieces. You can now add your monogram initials for just $10! This tee now comes in this darling stripe print too! 5. We popped on over to Saks Fifth Avenue to find the most amazing pieces on sale! This sunshine yellow puff-sleeve dress is over $100 off and this darling red + blue midi dress is on sale too! Our go-to pajamas are on major sale including this mandarin print set, this cozy silk satin set, and this Champagne caftan! 6. Exciting news - Neiman Marcus is hosting their Gift Card Event! We love that the more you spend, the more you get back! We’re snapping up this stunning floral print dress, this a-line midi dress, and this blue + white striped pocket dress! 7. We had to share a few pieces of art we’ve been eyeing from one of our favorite sources! As you know, “color makes us happy,” and we love this Champagne gold framed piece. We’re also eyeing this antique gold oil painting and this mesmerizing piece, by one of our favorites! 8. Speaking of “color makes us happy,” our new tees launched this week! Inspired by our not so secret love for color, this crew neck comes in unisex sizing and is printed right here in Nashville, TN. We can't wait to see what you create in your new colorful P+P tee! P.S. we still have a handful of “Howdy” totes available - snap them up now! 9. A thoughtfully curated collection of coffee table books is one of our favorite ways to make our home feel more personal and vibrant. We’re always searching for books that offer inspiring reading material on the inside while equally making a decor statement on the outside. Since there’s nothing we love more than a getaway we can’t get enough of this Slim Aaron’s book and the talented, Amanda Lindroth’s book. 10. We’re always on the hunt for the perfect bag and we’ve been eyeing so many from one of our very favorite sources! We are crushing on this adorable top-handle leopard print one, this woven basket bag, this refreshingly modern bag, and this colorful midi sac. Happy Thursday, y’all! We’re feeling all sorts of inspiration from this storytelling mood board - it’s absolute perfection! It’s no secret that COLOR MAKES US HAPPY so without further ado, we bring you this week's color crush… BLUE! We absolutely adore this blue and white bone-inlay wall mirror. You can always shop of blue + white favorites here! Give us cashmere everything! It couldn’t get more classic than this crewneck sweater. We love how soft it is to the touch and the darling relaxed fit. No Monday blues here! We’ll be spending our sunny weekend sitting on our patio in this iconic bistro chair! We love this new piece from Serena & Lily and we are loving it! You know we can’t resist a great pair of statement earrings! This oxide blue pair is perfect for adding a pop of color to any outfit. We are also loving these darling blue heart drop earrings, these pom pom oxidized earrings, and you know we can’t resist this pair. Say, “hello” to your new favorite trinket box! The perfect bedside set for storing all of your trinkets like our go-to statement earrings! Our cozy denim bedroom rug is the perfect touch!! It’s equals parts charming and stylish, adding the perfect flare to your space. We are currently obsessed with this always flattering short-sleeve wrap dress. we’re most definitely adding it to our getaway favorites and lucky for you, you can earn up to $500 when you make your purchase! We love adding a pop of color (because you know “color makes us happy”) to any room with our color studies. This one is perfect to add to a boys nursery, office space, or living room! The best part about these color studies is that you can mix and match a variety of colors! Spring has been a busy season of traveling for us! Thankfully, we have this cobalt luggage tag to make it easy for us to spot our luggage. Oh, and did we mention you can add a personal touch with your hand-painted monogram initials? We adore this frosted sky sweater that we plan on pairing with these darling kick-flares! It's soft and flattering… so you can totally justify buying several. You can also add your monogram for just $10!! Plus, it’s on sale today!! This embroidered pillow cover adds the perfect pattern pop to your space! It perfectly pairs with our favorite sheet set that’s on sale today (under $200)!! If you’re looking for new bedding, our-go to is having a major sale!! This darling bag is perfect for carrying all of your necessities! The way you carry it is customizable which is why we are loving it and adding it to our handbag favorites! We also are eyeing this blue velvet crossbody, this calfskin bag, and this spurge-worthy bucket bag. This floral rug is the perfect combination of both modern and traditional to add to any room. We adore the fringe detailing and you can get it for under $90!! 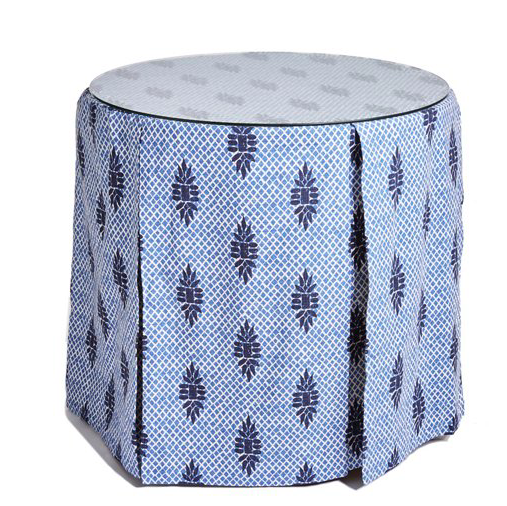 It also pairs perfectly with our favorite banana leaf counter stools or these bistro style stools. We aren’t one to shy away from cozy pajamas, and lucky for us, this vintage inspired set is 15% off today! You know we’re a sucker for chic pajamas and every once in a while you may spot us dressing them up with a darling pair of gold knot mules. how amazing are these color-blocked earrings? take 20% off this pair of statement earrings! these raffia fringe earrings are so festive and fun! Happy Tuesday, y’all! It’s no secret that we adore a bold statement earring so we thought we’d do a mid-week roundup of our favorites… because what’s happier than a fun pair of earrings?!?! We’re swooning over these two toned twist hoops - they’re perfect for spring and soon to be a part of our getaway favorites! One of our go-to pairs of earrings are these beaded shell earrings (currently on sale for $69)! And speaking of our favorites… we wear these blue pom pom oxidized earrings all the time (they are incredibly lightweight) and are thinking we need to add the new seafoam pair to the tippy top of our wishlist! Great news - Saks Fifth Avenue is currently hosting their friends and family sale and the deals are amazing - 25% off clothing, shoes and bags, and 20% off jewelry! We adore all earrings by LeLe Sadoughi and a few of our favorites are part of the major sale! Take a peek at these lily earrings in lilac (the prettiest color), these chunky boho hoops, and these sweet daffodil earrings in tortoise shell. Her jewelry is truly art! And because you know we love to score a great deal… here are some of our favorites under $50! We adore these black wicker hoops, these darling pearl hoops, these oversized blossom earrings, and these bamboo hoops. J.Crew is currently hosting a spring sale and these floral chandelier earrings are $47 along with these crystal and tortoise hoop earrings, now $43! Oh, and our go-to hoops are a steal at under $14!